Discussion in 'Masonic Blogs' started by My Freemasonry, May 26, 2012. The Brothers of Moosup Lodge No. 113 in Moosup, Connecticut will once again present a Quarry Rite Master Mason Degree at a working stone quarry just outside of town. The Degree will be on Saturday July 14, 2012. 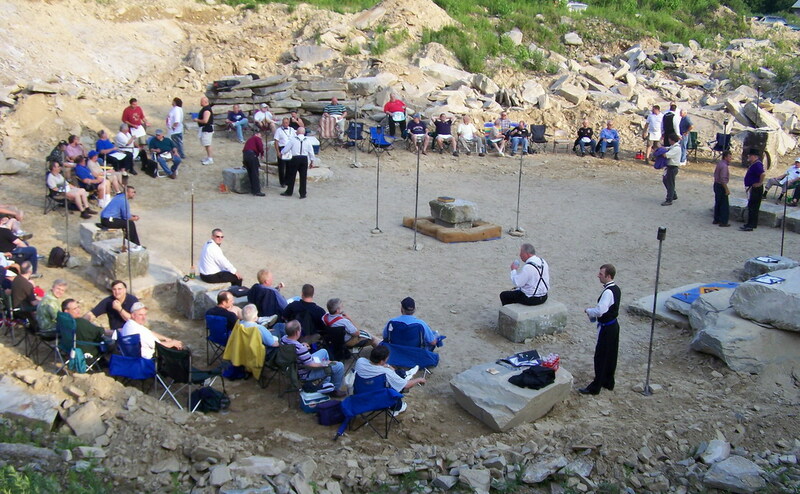 The Quarry Rite, normally held on or near the Summer Solstice, is a one of a kind degree, performed outdoors, by torchlight, in an operative quarry. Under the stars, standard Connecticut Ritual is augmented by soliloquies written specially for the event. Reservations are required for the cookout dinner. Yet another Masonic thing to add to the list!!! Very cool. Down here, since nearly everything "stone" like is built of concrete, would it be a gravel-pit degree? I've attended one outdoor degree, but never in a stone quarry. I wish I could be there for that one. That is going to be pretty awesome I'm sure. I hear reservations fill up quick...I know the reservation is needed for dinner, not sure if you need to reserve a seat for the degree though. They do this every year so I won't be going this year but definitely looking to get to Moosup next year.